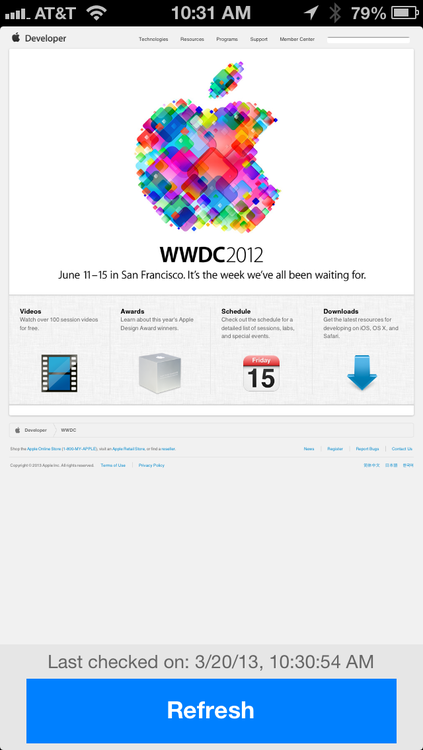 It occurred to me that I frequently refresh the WWDC page on my iPhone and it might be useful to write a small app that will do it for me and notify when the page updates. So I ended up putting together WWDC Alert App and have pushed it on github – https://github.com/rmatta/WWDCAlertApp for anybody to download and install. Due to the use of location services and constant network to refresh, it uses higher than average battery power. On my iPhone 5, it used about 15% of battery over 6 hours.